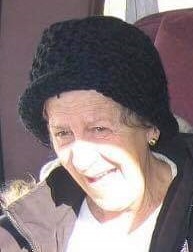 Donna M. Goodman, 71, of 1226 Buffalo St. Franklin, PA. , went to be with her husband on Sunday Feb. 10, 2019. Born August 28, 1947 in Oil City, PA., she was the daughter of the late Harold Benjamin Biltz & Mary Margaret Lewis Biltz. Donna was a 1965 graduate of Oil City High School. She was married on Feb. 15, 1973 to David E. Goodman and he preceded her in death on Sept. 26, 2009. Donna had worked many years at Famoore's and was currently working at the Caring Place in Franklin as a personal care aide. She was a member of St. Patrick's Church and formerly attended St. Stephen's Church. Donna enjoyed playing bingo, cooking, baking and reading and spending time with her grandchildren and great grandchildren. She was a Kansas City Chiefs fan. Donna had been a member of the Oil City VFW Auxiliary and was currently a member of the Franklin VFW Auxiliary. and a brother-in-law Harold Goodman of Georgia. Memorials may be made to the Reinsel Funeral Home at 116 Bissell Avenue Oil City,PA. 16301 to help the family with funeral expenses.